In the Junco-II, I replaced the vintage Vifa M21WO-39-08 with a newer 8″, the HiVi M8a. Frankly, this is not the right woofer for a 2-way because of the cone breakup. In my previous attempts, I found the M8a crossed best below 1kHz. But since the Vifa M21WO is no longer in production, I thought it would be a good opportunity to try it with the M8a. I have my reservations though. The M8a and the TN28 are simply not compatible. (20 Liters Bass Reflex, Baffle Width=10.5″) Fig 1 – HiVi M8a Frequency Response. Mic on axis, Impulse Window 5ms, No smoothing. The plots in Fig 1 show what I’m up against. The Black plot is the M8a RAW response, displaying a huge peak at 2.5kHz. The Blue plot is with a 2nd order low pass network at 1.8kHz. The offending peak is lowered by 12dB but I doubt this is enough. Fig 2 – HiVi M8a with HiVi TN28 Frequency Response. Mic at 1 meter, tweeter axis. Impulse Window 5ms. No smoothing. The Red plot in Fig 2 is the HiVi TN28 with a 2nd order high pass network at 1.8kHz. It is quite obvious that the M8a and the TN28 will not sum well. Ideally, I would cross at 1kHz~1.2kHz but that’s impossible with a hifi tweeter. I would have to resort to a compression driver for that. Fig 3 – Summed Response of M8a and HiVi TN28. Mic at 1 meter, tweeter axis. Impulse Window 5ms. No smoothing. Fig 3 shows how bad the summing is when the woofer and tweeter are incompatible. Clearly, this will not do. I was tempted to abandon the M8a with the TN28 idea except for a moment of inspiration. I threw conventional filter theory out the window and reworked the crossover and viola, I got what I was after. Fig 4 – Summed Response of HiVi M8a with HiVi TN28. Mic at 1 meter, tweeter axis. Impulse Window 5ms. No smoothing. Fig 4 is the final summed response of the Junco-II. This is a major improvement over Fig 3. It is still not perfect. There is a minor dip at 4kHz but it won’t affect the sound. Considering the absurd combination of woofer and tweeter, I am more than happy with this response. Fig 5 shows the elegance of my crossover. When the tweeter is wired in reversed phase, two deep nulls are seen, one at 1.5kHz which is the crossover point and the other at 2.6kHz, which is the M8a cone breakup peak. All with minimal crossover components. Fig 6 is the Waterfall plot of the Junco-II (courtesy of REW). Time Range is 1.2ms, so this is a highly magnified view. The CSD shows the M8a peak at 2.5kHz is well suppressed. Fig 7 – Junco-II TES. Impulse Window = 5ms. Mic at 1 meter, tweeter axis. The light blue slices in Fig 7 indicate excess energy at 3kHz and 8kHz. This is consistent with the Waterfall plot in Fig 6. Surprisingly, the TN28 is exceptionally clean above 10kHz. 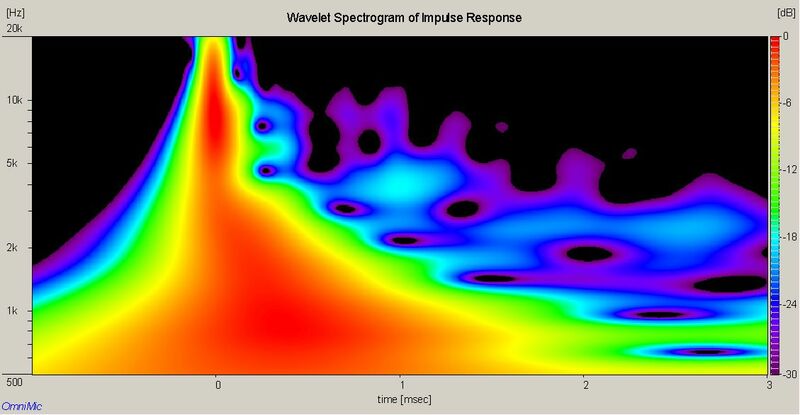 The excess energy at 2.5kHz and 4kHz in Fig 7 are represented by the blue and violet patches in the spectrogram. They are no cause for alarm as they are still within acceptable limits. The spectrogram also shows good integration of woofer and tweeter at the crossover region. The Harmonic Distortion of Junco-II (Fig 9) averages -55dB below the fundamental. There are nothing unusual. A 3rd order distortion from the M8a woofer is seen at 800Hz. It is nothing to worry about as it is well below the fundamental. The Junco-II lowest impedance is at 7Ω. The electrical phase is quite ordinary. It is only +40% at 1kHz. Taken together, the Junco-II will hardly stress power amplifiers. To the left, the valley between the two peaks indicates the Junco-II is tuned to 40Hz. The Junco-II has some mid-bass boost which will appeal to a broad spectrum of listeners. She sounds fantastic with albums like Fourplay, Santana, Jaime Valle, Bela Fleck, Eagles and Dire Straits. Mid-bass is loud, tight and punchy. While the mid-bass is the outstanding feature of the Junco-II, what is more important is that it doesn’t overwhelm the midrange. Vocals are not muffled and can still be clearly heard. As for the treble, I can find no fault with the HiVi TN28. I’m using this tweeter at her limits and I can’t detect any shrillness. The TN28 is amazingly good. And it cost less than $20. Note – the M8a needs some serious breaking in. When I first heard it, I thought the woofer was faulty. It was that bad. I had to use a 30Hz tone over a couple of days to loosen her up. After that, the M8a sounded real nice.